One can hardly manage without a smartphone in this era. Nowadays, you don't have to travel with your laptop every day for business emails and official updates as a smartphone can easily do that. Smartphones are also a great way to keep connected socially. Jumia Egypt has a wide collection of smartphones including the latest models. Shop online for smartphones such as iPhone, Samsung, Tecno, Huawei smartphone, Oppo, Sony, Infinix and Xiaomi. At Jumia Egypt, we stock only the best cell phones and our mobile prices are very reasonable. Browse through our site for our huge collection of smartphones, compare the different mobile phones we have using their prices, the connectivity, the display size and the ratings. Shop for any kind of smartphone conveniently using Jumia Egypt. Pay securely online or cash on delivery. 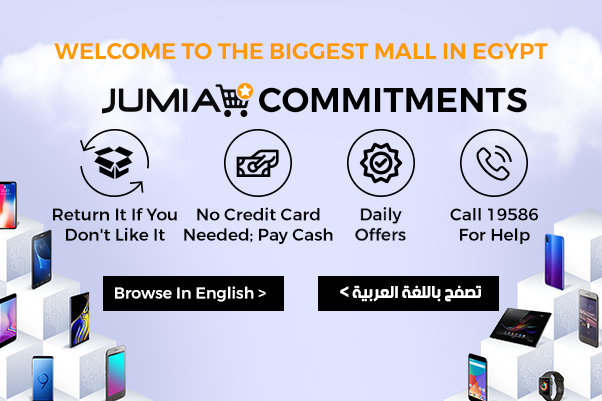 Shopping for a smartphone just became easier with Jumia Egypt. Order your phone from our online mobile store and have it delivered to an address of your choice. Discover also, our wide collection of home phones which includes handsets which are either wired or wireless. Check out our huge collection of phone accessories too. Shop for brand new smartphone at the lowest and most affordable prices in the market during our Mobile Week campaign. Jumia Egypt provides an endless variation of smart phone to choose from and amazing deals and offers every day, so don't miss out and order your favorite products while quantity lasts. Mobile Week is the biggest campaign of the year for mobiles, tables and accessories, so stay tuned and shop online today!